IPM techniques help keep New England businesses pest free. When it comes to your business there is one thing for certain, pests do not belong there! Whether they’re dangerous or not, pest infestations can have a negative impact on businesses, including damage to a company’s hard earned image and reputation. Thankfully, commercial pest control services have evolved from being reactive to proactive with the implementation of Integrated Pest Management (IPM). IPM is a broad view of pest control that encompasses more than just the traditional application of pesticides to get rid of pest infestations. It also includes the implementation of preventative measures and promotes a strong relationship between the pest control company and the business seeking pest control. 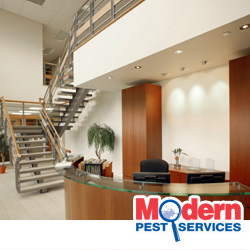 Business owners and managers throughout New England are now working with the pest managment professionals at Modern Pest Services to ensure that their facility remains pest free and is in compliance with environmental and governmental regulations. Prevention of pests through various pest-proofing techniques implemented by both pest management professionals and company employees. Inspection of the facility to find and eliminate pest “hotspots”. Treatments that are effective and in compliance with the EPA, LEED, and U.S. Green Building Council like Modern’s ECOCARE Programs. Continuous monitoring to ensure that pests do not become a threat to businesses. Another component of IPM includes organic pest control and other natural pest control services to reduce the chemical impact on the environment. In some cases there is no need for chemicals at all! And even if treatments are necessary, you can be assured that by working with your pest management professional to implement ongoing integrated pest management techniques, your business will be well protected by the threat of pest infestations. If you own or operate a business in New England including in Maine, Massachusetts, or New Hampshire and you are interested in learning about how IPM can safeguard your business, please contact us today. At Modern Pest Services we are always committed to providing quality services to ensure that pests do not tarnish your business’s image.